A "pony" bell strap is any strap that has two or more rows of small bells. Despite its name, it can be made any length to fit any equine from mini to draft, although it does seem to be true that most pony straps are made for smaller horses. This strap, patterned closely after the original, is about the right length to fit around the body of a real pony. The 52 bells are an assortment of late 1800s petal and round ridge bells with a few early 1800s petal bells scattered throughout. The bells graduate in size from #5 bells (1 5/8") in the center to a tiny #00 bell (7/8" across) at each end. 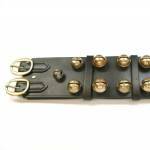 The bell strap is black bridle leather about 64 inches long and 4 inches wide. The billets (tongue) sewn to one end of the bell strap add another 11 inches to the finished length.